A British scientific expedition has discovered the world's deepest undersea volcanic vents, known as 'black smokers', 3.1 miles (5000 metres) deep in the Cayman Trough in the Caribbean. Using a deep-diving vehicle remotely controlled from the Royal Research Ship James Cook, the scientists found slender spires made of copper and iron ores on the seafloor, erupting water hot enough to melt lead, nearly half a mile deeper than anyone has seen before. The expedition to the Cayman Trough is being run by Drs Doug Connelly, Jon Copley, Bramley Murton, Kate Stansfield and Professor Paul Tyler, all from Southampton, UK. They used a robot submarine called Autosub6000, developed by engineers at the National Oceanography Centre (NOC) in Southampton, to survey the seafloor of the Cayman Trough in unprecedented detail. The team then launched another deep-sea vehicle called HyBIS, developed by team member Murton and Berkshire-based engineering company Hydro-Lek Ltd, to film the world's deepest vents for the first time. 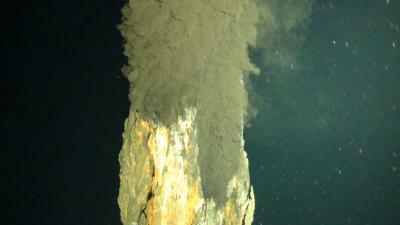 "Seeing the world's deepest black-smoker vents looming out of the darkness was awe-inspiring," says Copley, a marine biologist at the University of Southampton's School of Ocean and Earth Science (SOES) based at the NOC and leader of the overall research programme. "Superheated water was gushing out of their two-storey high mineral spires, more than three miles deep beneath the waves". He added: "We are proud to show what British underwater technology can achieve in exploring this frontier - the UK subsea technology sector is worth £4 billion per year and employs 40 000 people, which puts it on a par with our space industry." The team aboard the ship includes students from the UK, Ireland, Germany and Trinidad. "This expedition has been a superb opportunity to train the next generation of marine scientists at the cutting edge of deep-sea research," says marine biologist Paul Tyler of SOES, who heads the international Census of Marine Life Chemosynthetic Ecosystems (ChEss) programme. The expedition will continue to explore the depths of the Cayman Trough until 20th April. The team are posting daily updates on their expedition website at http://www.thesearethevoyages.net/, including photos and videos from their research ship. "We look forward to sharing the excitement of exploring the deep ocean with people around the world," says Copley.